Italy has castles in abundance, in fact our story That Castle on your Coin pointed out that there are 747 of them. Italy has a rich history of both being conqueror and conquered and because of this diverse past, many great castles have been erected; some now are nothing more than ruins whilst others retain their grandeur and are in pristine condition. Choosing four different castles was a difficult task as I wanted them to be very different from each other, so I’d like to introduce one with internationally renowned architecture, one that sits precariously in the sea, another with a turbulent past and the remaining one with an immoral legend attached to it. 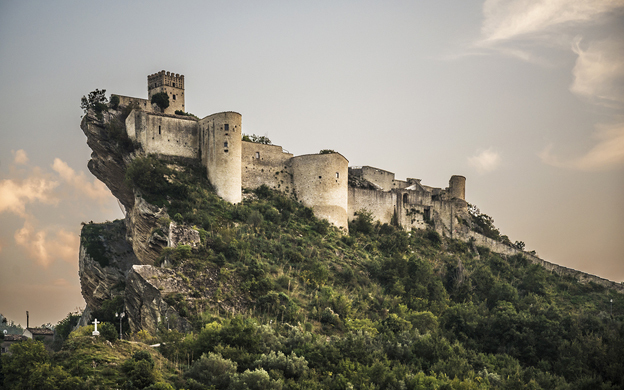 Famed for its excellent architecture, Fénis castle is possibly one of the most famous in Italy. 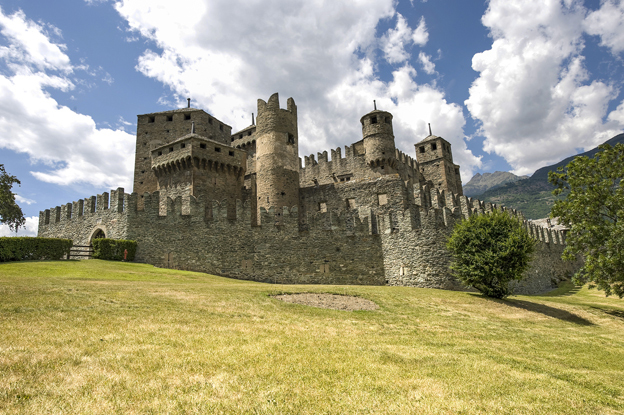 Located in Valle D’Aosta near the Swiss and French borders and originally the home of the Challant family, the castle’s appearance has changed over the centuries. From 1320 to 1420, the structure was expanded and the pentagonal shape created. Three of the corners have round towers; the largest towers are on the south and west corners. These towers are linked by a walkway and enclosed within a double perimeter wall. The castle’s inner courtyard is decorated with grand frescoes of prophets and wise men, and the Annunciation of Saint Christopher. The one most visitors come to see is the superb fresco depicting Saint George slaying the dragon, situated at the top of the semi-circular staircase leading to the castle’s balconies. Divided over three floors, Fénis castle is now a museum and welcomes tourists from all over the world. Tours are accompanied and limited to 25 people. Admission is €5.00 and for up to date information telephone: +39 0165 764263. Once taken and used by Napoleon as a military base, this magnificent fortification is situated within Parco Sempione (Sempione Park) in the heart of Milan. Constructed in 1360 by the widely despised Visconti family, the castle stood as an arrogant testament until the death of the last family member, Filippo Mario, in 1447, when in defiance the local population demolished the original castle. The castle was then rebuilt by the Sforza family from 1450 onwards, creating a luxurious residence. 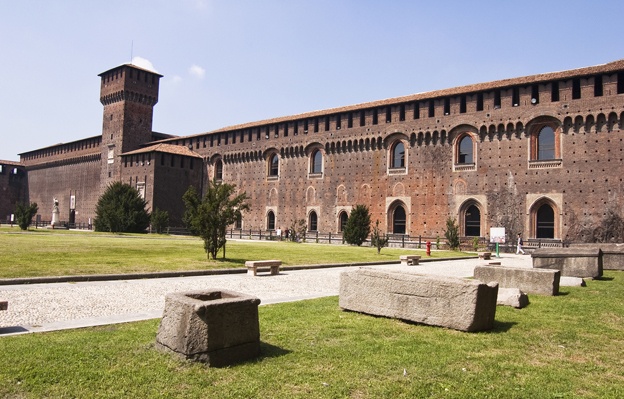 When the French invaded Milan in 1499, they began the transformation from family home to fortified military garrison. Then, during Spanish occupation, extra fortifications were added including sloping defensive walls and further percorsi segreti (secret passages). Dating back to the late 14th century, the passages began evolving and in the late 16th century, the Spaniards added a huge network of labyrinthine tunnels. The castle now houses seven museums and has become one of the city’s major tourist attractions. For information, opening hours and fees, visit the website. 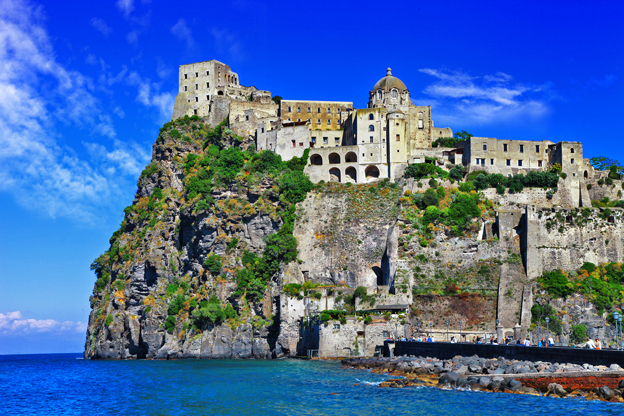 Perched upon a volcanic rock in the gulf of Naples looking over the water is Castello Aragonese, which, despite being detached from the island of Ischia, is its most impressive large structure. Construction of a fortress on this location began in 474 BC by Hiero I of Syracuse and initially consisted of a pair of towers overlooking the sea. The ancient people of Naples, the Parthenopeans, took control of the rock until the Romans claimed it in 326 BC, before losing it again to the Parthenopeans. Eventually, in 1441, control was in the hands of Alfonso V of Aragon who built a stone bridge connecting it to Ischia. The castle exterior looks austere, its ancient walls and ramparts merge well with the bleak and weather worn rock-face. Once you have made the 113-metre climb, it’s not difficult to see why it is Ischia’s most visited attraction: it offers breathtaking views (for those with reduced mobility there’s an elevator). Other attractions are the churches that include the tiny chapel dedicated to San Giovan Giuseppe della Croce (St. John Joseph of the Cross), and the Church of the Immacolata, built in 1737 and originally dedicated to St. Francis. The castle is open to the public every day from 09:00 am until sunset and admission costs €10, concessions exist for children and the disabled including free admission. For more information, call: +39 081 992 834 or click here. Overlooking the hills surrounding the Sangro River in southern Abruzzo is the small town of Roccascalegna. It is said that the 1,400 inhabitants of this mountain town are descendants of the Langobards, a Germanic tribe from northern Italy who ruled the country from 568 to 774. It was the Langobards who began construction of the castle, first building a tower whereby they could watch for Byzantine forces. There’s very little historical documentation pertaining to the castle apart from a brief record of its financial position in 1320 and a document detailing the restoration of the entrance steps in 1705. What intrigues visitors who venture to the castle isn’t its history but its infamous legend, The Right of the First Night. The legend pertains to Baron Corvo de Corvis, a feudal baron who filled the people of Roccascalegna with fear. High taxes and brutal punishments were par for the course until he introduced Jus primae noctis, a medieval feudal custom that meant that every newly-wed bride from the town must spend her first night of marriage with the baron up at the castle. The passing of the law angered the parish priest who was executed at the entrance to the town as warning to anyone who disobeyed the new law. Legend dictates that one winter’s night the Baron was stabbed to death by a young bride who had been sent to the castle to share his bed. Some say it was the groom in disguise that undertook the deadly deed, but the tale says that, as the slain baron lay dying, he vowed revenge and his bloody hands left an imprint upon the walls of his bedchamber. Despite many attempts to wash away the handprint, it continued to reappear until in 1940 the tower collapsed. The elder members of the town still swear to have seen the ghostly red hand-print and visitors to the castle, which was restored in 1996, are encouraged to seek it out. For more information and opening times, visit the castle’s website.